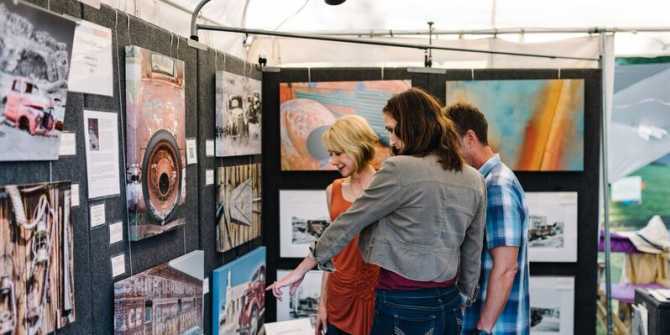 One of the biggest Wichita art events of the year – in fact, one of the area’s largest juried fine arts shows – is Autumn & Art, which takes place Sept. 14-16 at Bradley Fair in east Wichita. We’ve put together this quick guide to help you enjoy the 9th annual event, which offers three days of art and entertainment. It’s free! Organizers are able to keep the event free with the help of local business sponsors as well as patrons, individuals who pay $120 per person to support the event. Patrons receive perks throughout the weekend, from reserved parking to complimentary beverages and an exclusive opening-night party. Plenty of convenient parking is available in the Bradley Fair parking lots. Autumn & Art accepts about 100 artists, including a mix of local, regional and national talent. Invited artists from across the United States set up booths lakeside along the Bradley Fair Parkway, the street separating the shopping center from the nearby residential neighborhood and office complex. They will show and sell original work in 14 media: ceramics, digital, drawing, fiber, glass, graphics and printmaking, jewelry, metalworks, painting, photography, sculpture, wood, two-dimensional mixed media and three-dimensional mixed media. This year’s featured artist is Chris McCarthy, a glass blower from St. Louis whose work is Venetian-inspired with a concentration of murrini-based designs and a mix of cold-working techniques. After a piece has been blown and cooled back to room temperature, he sand-carves or wheel-carves it to give each its own unique design and texture. Each day’s entertainment schedule features live music, dance, theater and art demonstrations. This world-class alfresco art gallery is free to explore but you’ll want to bring money for the edible art. Autumn & Art’s Culinary Pavilion offers food from Bradley Fair restaurants. Wine, beer and soft drinks are available at cash bars to enjoy as you stroll the parkway. Art-inspired activities and games for all ages are available throughout the parkway. Look for Artie, the art-collecting squirrel, to find activities geared for kids. Artie’s Art Studio offers free hands-on art projects directed by Mark Arts educators. Artie’s Clubhouse is a kids-only gallery for young collectors-in-training with artwork priced for a kid’s budget. For $5 per person, you can take a spin around Bradley Fair Lake in a paddleboat. Plan now to attend the ninth annual Autumn & Art. It’s open to the public 6-9 p.m. Friday, 10 a.m.-7 p.m. Saturday and 10 a.m.-5 p.m. Sunday.